Grand opening is Thursday, May 29, 2014. Yes indeed, as several people have inquired on the CVG Facebook page, the historic, or at least kind of historic, El Torito restaurant at the corner of Moorpark Road and Brazil St in Thousand Oaks that poured its last margarita on January 24, 2012 is now demolished. Was that a run-on sentence? Well that mean I need a margarita. Blended, light salt, please. I digress. This location will continue to not be serving margaritas for the foreseeable future as a new Chick-fil-A restaurant has been approved for the site and is anticipated to start pulling building permits for the location early next year. No details on the timing of the grand opening of this soon-to-be second Thousand Oaks Chick-fil-A location but I'd imagine we're looking sometime perhaps in the summer 2014 time frame. Just my guess. 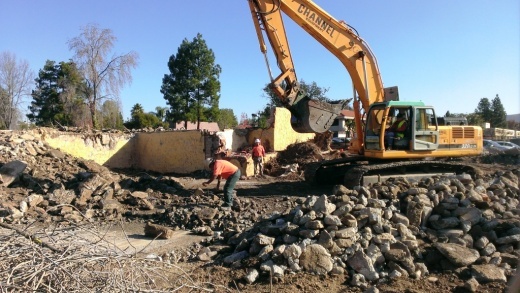 The Thousand Oaks El Torito was reduced to rubble last week. Ah yes, the El Torito we shall always remember. I for one will miss this place.